The ST 9" Side Loading Flare Launcher features the latest in design and manufacturing technology. Parts are CAD designed and CNC machined from solid billet material rather than the typical stamped and welded construction of other launchers. The 6061 and 7075 aircraft grade aluminum components are anodized in Type III Hardcoat black for maximum durability and ease of maintenance. Additional components are built from 1018 cold rolled steel and plated with a Mil-spec black oxide finish. The proprietary STZ push button cylindrical breech lock design is 3 times stronger than existing lever lock systems. 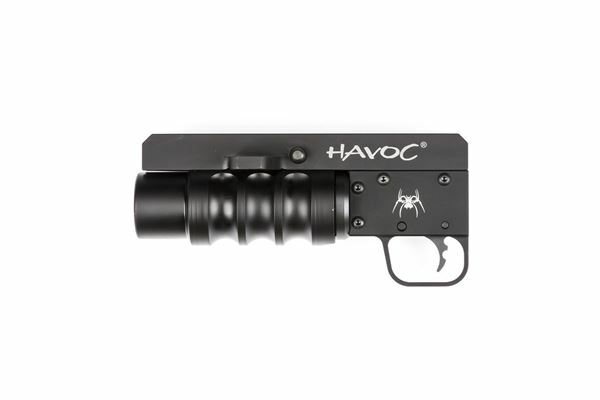 The Havoc is designed to mount on any Mil-Spec rail system. Installation simply requires sliding the launcher onto the bottom rail of the hand guard and tightening two set screws which are included.